Triplets (from left) Leslie, James and Stephanie Manning graduated on Saturday. 4:30 p.m., May 31, 2014--When the Manning triplets received their degrees at the University of Delaware’s Commencement ceremonies on Saturday, May 31, it marked the culmination of a shared educational journey that began in kindergarten at Hickory Flat Elementary School in Woodstock, Georgia. Now officially Blue Hen alumni, Leslie, Stephanie and James Manning were born one minute apart -- in that order -- at Christiana Hospital in Newark on April 20, 1992. For parents James and Andrea Manning, the joy has been to watch their children grow up together while developing their own individual personal identities. Described by her father as a natural athlete with the first-born trait of leadership, Leslie Manning was the first to excel in sports. While Stephanie Manning, as a middle child, was more reserved, she developed an early love and talent for art while approaching sports in a different way, her father said. Son James Manning, described by his father as the “baby by a minute,” has always been the inquisitive one, and was always trying to figure out how things work -- why they did what they did and what could make them better. Leslie Manning recalls that growing up, the siblings were never allowed to be in the same classes together before college, but she did have the opportunity to take a couple of classes with her brother James at UD. A self-described introvert, Stephanie Manning said that sharing her UD experience with James and Leslie definitely helped ease the shock of college and new people. While all three siblings were not able to take a class together, they did take classes with one another and would share rides on the buses, brother James Manning said. Manning also appreciated the support he received as one of the first students to graduate with the new biomedical engineering major. 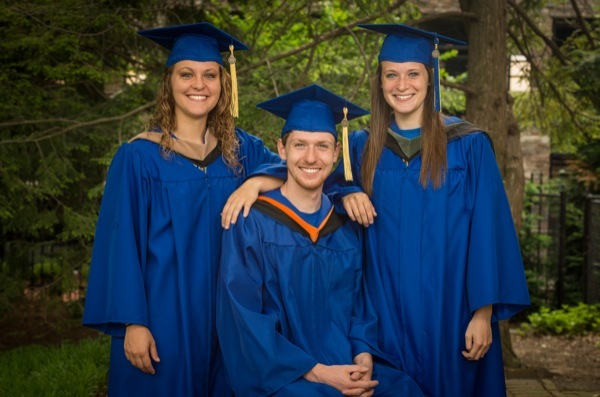 Post-graduation plans for the Manning triplets include entering the workforce for James, and working for a year and applying to graduate school for physical therapy for Stephanie. Leslie wants to apply for a job while continuing to run the photography business she started. For their parents, getting used to an emptying house will be a challenge, but Andrea and James Manning are looking forward to the transition for themselves and their triplets. • UD held its 165th Commencement ceremony under sunny skies on Saturday. • Follow the conversation on social media by checking out UD’s Commencement Storify page. • See Commencement photographs at UD in Photos. • A video of Commencement is available. • Honorary degrees were presented to four outstanding individuals. • Ten members of the Class of 2014 were honored as high index seniors, with perfect grade point averages. • A doctoral hooding ceremony was held on Friday. • The UD Honors Program held a celebratory breakfast on Friday.